Now that the fall season is nearing, I’ve got the perfect project for you! 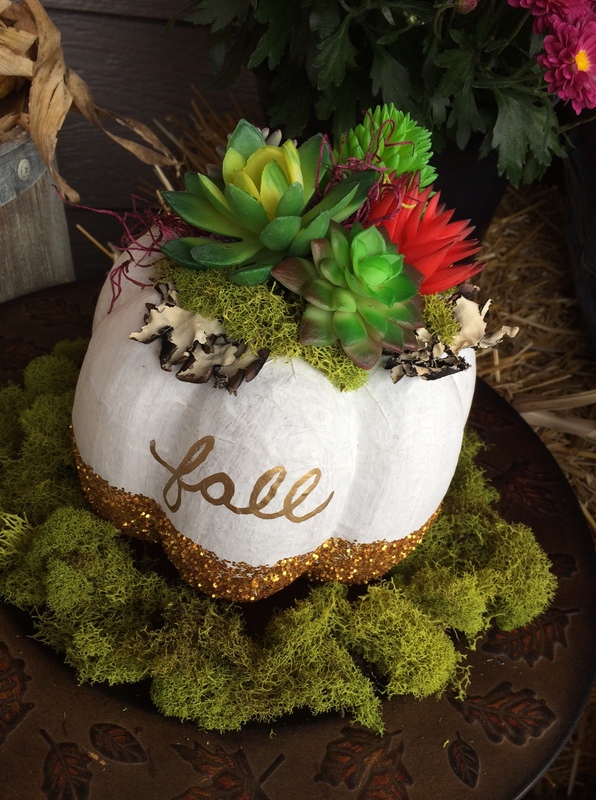 Succulents are the “in thing” right now and this Paper Mache Succulent Pumpkin works great with both fake and real succulents! 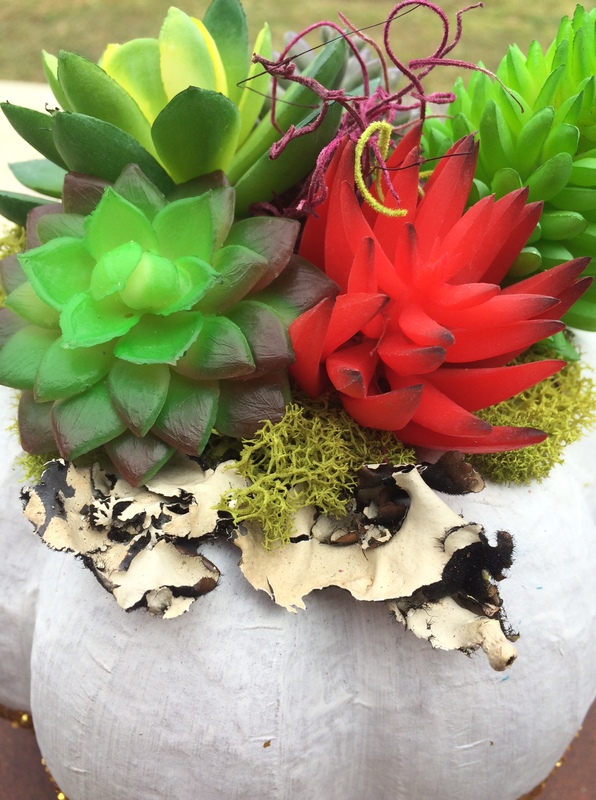 When I went to SNAP -a conference for all things creative – I got some of these succulents and floral foam from Floracraft. I have been patiently waiting to come up with the perfect DIY to use them with. 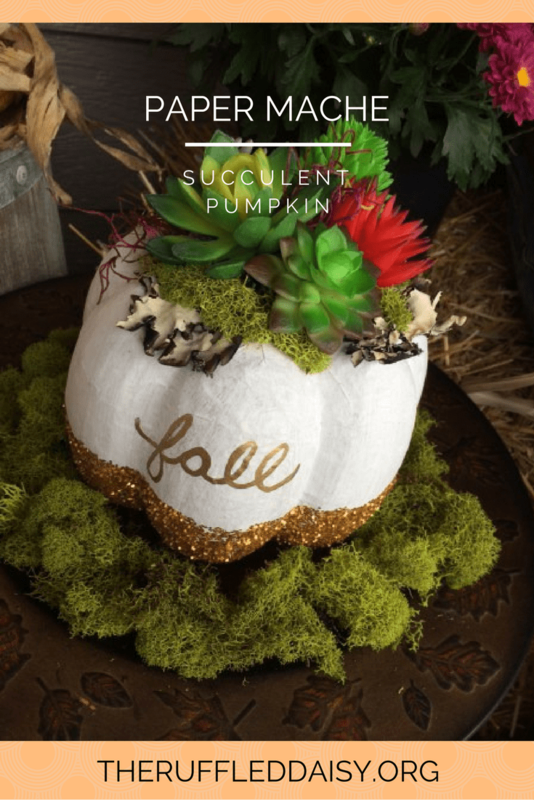 When I saw that Pottery Barn and few other high dollar companies were offering these succulent pumpkins, I knew I had to make one. Because let’s be honest, Pottery Barn isn’t in my budget. 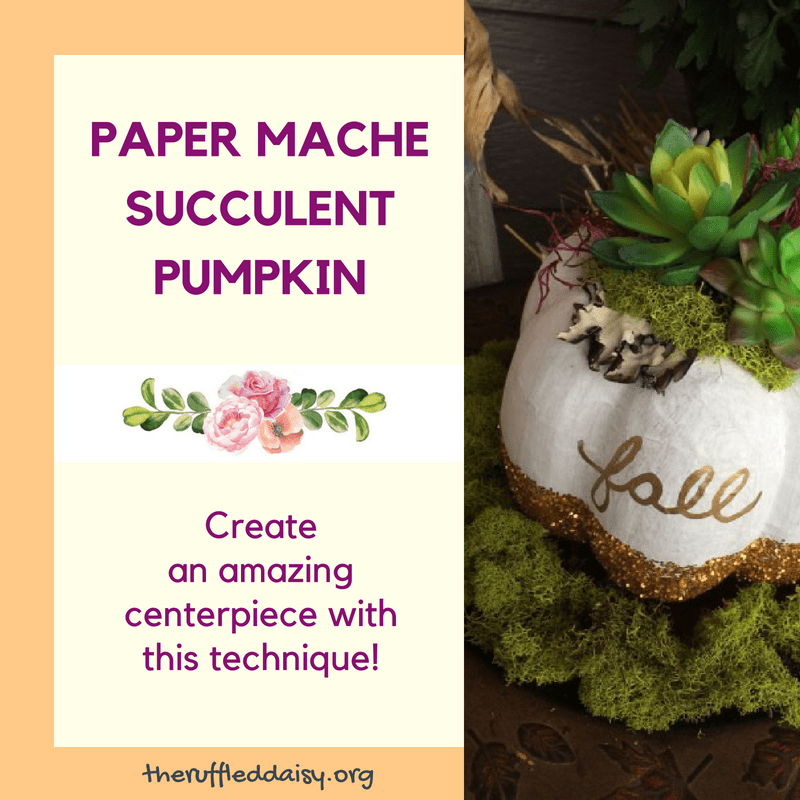 Here’s what you need to make your own Paper Mache Succulent Pumpkin! 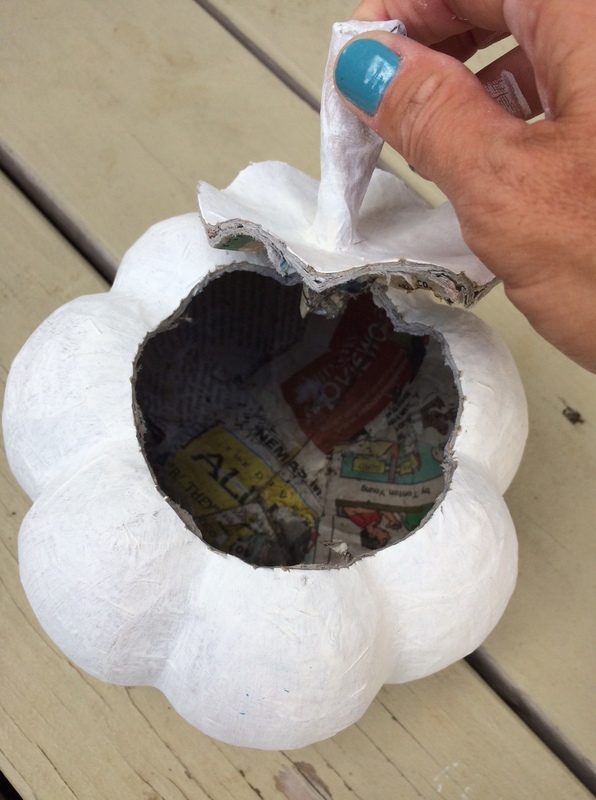 I started by painting my pumpkin white but you can use any color you’d like. After it was dry, I lightly drew a line where I wanted my lid to be cut and used an knife. Be careful – these little boogers can be tough! 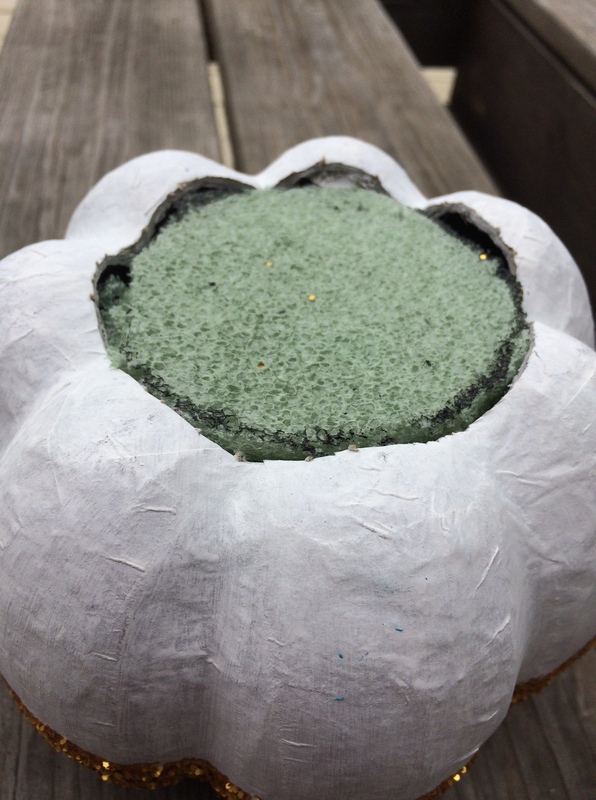 After my whole was cut, I used a block of floral foam closest to the size of the opening. You may have to trim the edges some. You’re going to want it to be a snug fit. If you are wanting to use this for real succulents then you will insert a bowl that fits your hole. The next FUN part was using modge podge and adding some glitter! 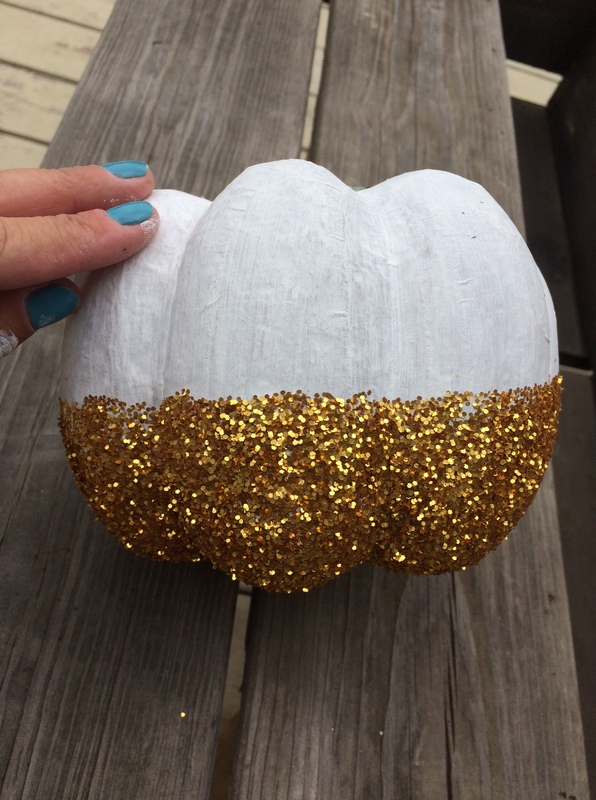 You can use your creativity here and do the bottom half like I did or cover the whole pumpkin in glitter! You can do a second coat when the first is dry if you aren’t satisfied with the coverage. 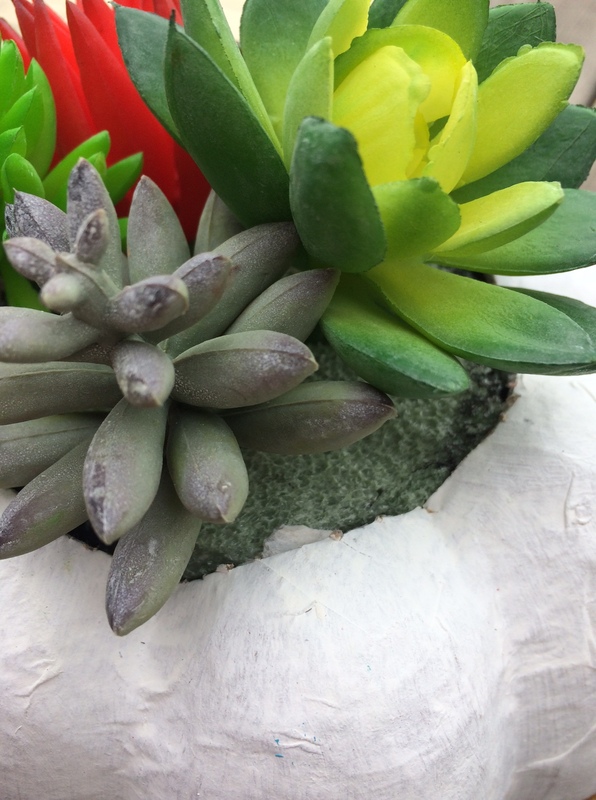 Using the succulents I had on hand, I randomly placed them throughout the floral foam. I am so impressed with the way Floracraft made these look so real!! I’ve never been a succulent lover but I sure am loving these! 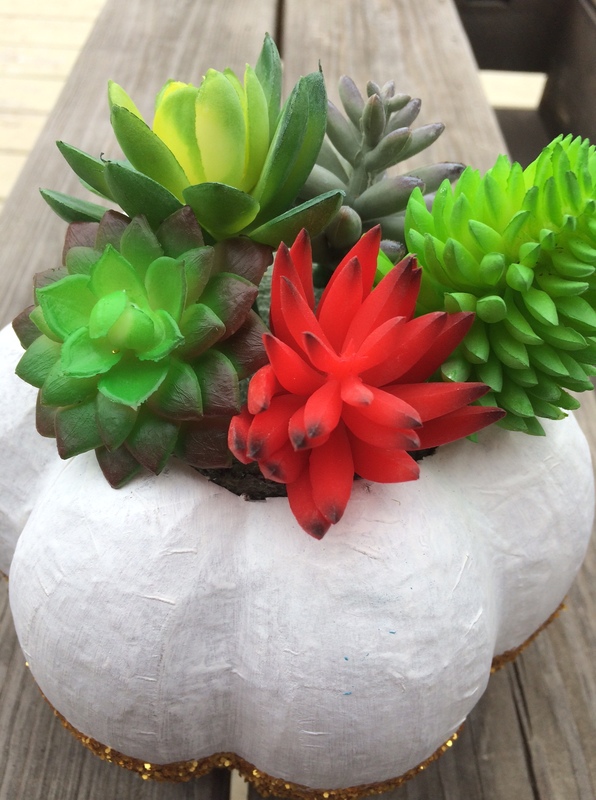 Once all of your succulents are in place, you’re likely going to have some foam showing. You can buy some fake moss and bark from any craft store and use that to fill in the bare spots. I just applied it with hot glue. Then the final touch for me was adding the word “FALL” with a paint pen to the front. You can leave it plain or dress it up anyway that you want. Display it on a fancy tray and add some acorns or moss around the base of it and you have the perfect centerpiece! This also makes makes the perfect gift for a hostess if you are traveling for any holiday dinners!! Are you ready to make your own? Here is an image that you can PIN so you can come back to it when you have all of your supplies together! PIN it and share it with all your friends! Better yet, get together with your girlfriends and create your own craft night making them together! Display it on a fancy tray and add some acorns or moss around the base of it and you have the perfect centerpiece for your Thanksgiving table! If you’re not hosting, it makes the perfect gift for the hostess! !